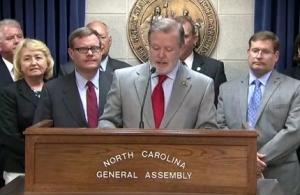 North Carolina state lawmakers unveiled a compromise budget package Monday that bundles a new round of teacher pay raises amid steep cuts for the state’s top K-12 agency and support for school choice favorites like vouchers and education savings accounts. The $23 billion spending plan is expected to move swiftly through the legislature. State senators are expected to hold the first of two votes on the budget deal Tuesday afternoon, while the House is expected to schedule votes later this week. Some of the deal’s most controversial provisions are likely to emerge in its public education provisions, which include unpopular reforms to the school performance grading system and rapid expansion of the private school voucher program without the accountability requirements included in the House budget passed last month. Teacher pay: Includes an average 3.3% raise in first year. In its inclusion of raises for most steps on the salary scale (with the biggest raises bound for teachers on steps 17-24), the plan is closer to the House salary schedule than the Senate’s proposal, which focused its raises on mid-career teachers. GOP budget writers say their goal is to reach average pay of $55,000 by 2020. Department of Public Instruction (DPI): The compromise plan softens the staggering, 25-percent budget cuts for the state’s K-12 bureaucracy included in the Senate budget, although it retains major reductions for an agency that focuses its intervention and training efforts on low-income and low-performing school districts. The new plan includes 6 percent reductions in the first year (about $3.2 million), followed by a 13.9 percent cut in the second year (about $7.29 million), all while adding 24 new reporting requirements for the agency. This does not include the budget’s plan to chop 11 positions in the agency, including three filled jobs, a loss of another $900,000 or so in funding. DPI audit: After years of allegations of wasteful spending in DPI, the budget includes $1 million for GOP Superintendent of Public Instruction Mark Johnson to commission an audit of the agency. Interestingly, the second year of the spending plan includes a $1 million DPI cut based on “anticipated savings” from that audit. The spending plan also includes $29 million in non-recurring funds over two years for a “modernization” of DPI financial accounting, a plan GOP lawmakers say will allow for increased transparency in the agency. School districts’ central offices: In keeping with the legislature’s clear skepticism of K-12 administrators, the budget includes a 7 percent cut to the state’s central office allotment for school districts in the first year, and an 11 percent cut in the second year, both a modest reduction from the Senate’s earlier proposal. Vouchers: As expected, the legislature retains a $10 million annual expansion of the so-called Opportunity Scholarship Program, which provides public funds for low-income children to attend private schools. The program, which is slotted for $44.8 million in funding in 2017-2018, is a lightning rod for public school defenders, who point out private schools lack the same accountability and non-discrimination requirements of public schools. And, with a report this year suggesting the state’s voucher students are not being helped by enrollment in private schools, the final budget deal eschews House calls for an independent study of voucher student performance and the requirement that voucher students take one nationally standardized test for comparison purposes. However, it allows for a task force to mull ways to evaluate voucher student performance, with a report expected next March. Personal education savings accounts: Labeled “vouchers on steroids” by critics, this program allows for the state to divert public funds to the private accounts of parents who seek to enroll their children in private schools. While it limits participation to parents of children with disabilities this year, it’s likely a first step in opening the door for greater access in the coming years, despite widespread questions about private school accountability and allegations of misspent cash in other states. School performance grades: The compromise deal nixes House proposals to reform a long-criticized method for assessing school performance. Advocates say student growth—rather than the school’s overall performance—should play a greater role in determining the score. Currently, the score is determined by 80 percent performance, 20 percent growth. A House proposal to establish separate grades did not survive conference committee negotiations. In addition, the deal announced this week also moves to a more stringent 10-point grading system in 2019-2020, rather than the 15-point scale preferred by advocates for school districts. Textbooks and classroom supplies: Amid myriad plans for boosting the state’s oft-criticized funding for classroom supplies, the conference committee emerged with a fairly conservative proposal, allocating about $11.2 million in a non-recurring boost to the allotment in the coming year. Critics say the state continues to fall far short of the necessary funding levels for this allocation, forcing teachers and school districts to spend to provide for updated classroom materials. Children with disabilities: One of the few bright spots of earlier budget proposals, according to some education advocates, the compromise increases the funding cap for children with disabilities, slotting another $6.3 million in recurring funds. Teaching Fellows: The plan, as expected, uses $6 million in cash from the state’s Education Endowment Fund to fund a new version of the teacher scholarship plan controversially scrapped by GOP lawmakers in 2011. The new version will focus on science, engineering, math, technology and special education, offering university scholarships for prospective teachers in exchange for a commitment to work in North Carolina. Lawmakers say they are hoping to address a well-documented drop in UNC students seeking teaching degrees in recent years. Superintendent’s office: With the state’s newly-elected GOP Superintendent of Public Instruction Mark Johnson mired in a battle with the State Board of Education over the hiring powers of his office, state lawmakers are getting involved. The budget includes a House proposal to allocate $700,000 for Johnson to create up to 10 new positions that report solely to him. The proposal had earlier earned the rebuke of the GOP chairman of the state board, who says the positions and funding are needed for other roles in DPI. Governor’s School: The compromise deal bypasses a Senate proposal to ax state funding in 2018-2019 for the five-week, summer program, which focuses on academics and arts. Advanced teaching roles: The budget will spend an additional $7.1 million in non-recurring funds next year, bringing the total to $8.2 million, on a three-year pilot program aimed at offering incentives for so-called “teaching leaders” in school districts. Eastern N.C. STEM: The deal restores funding for a summer science, math and technology program that’s primarily served low-income, black youth in eastern parts of the state. GOP budget writers in the Senate stripped funding from the program in an early-morning cut that seemed a retaliatory strike against Democratic critics of the Republican budget. Keep checking back with Policy Watch for updates and feedback from top education advocates. When we all know come the 2018-19 year the budget will be reviewed and there will not be a 9.6% raise! honest, gutless and what other adjectives you can name for this group of sorry politicians. goes beyond any words that I can list here. Nice job guys, idiots.